Glass is known to be a “water loving” (the technical term is hydrophilic) surface and this makes adhesive bonds, particularly with acrylic adhesive systems, susceptible to change in high humidity conditions. The good news is that a simple treatment of the glass surface with a silane coupling agent reduces this “water loving” behavior and improves the bond strength of the tape when subjected to high humidity and moisture. 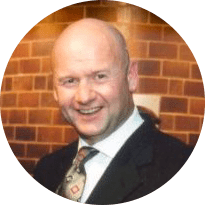 What are Silane Coupling Agents? The chemical name for the class of silane coupling agents found to be most effective as a glass pretreatment is 3-Glycidoxypropyl trimethoxysilane resin (commercially known as Dow Corning Z6040). The important thing to understand is that this class of silanes possess both organic and inorganic reactivity that allows them to “couple” organic polymers (tape) and inorganic surfaces (glass). The trimethoxysilyl group is subject to hydrolysis (reacts with water) and that is why the pretreatment is offered in a water/isopropyl alcohol blend (like the rubbing alcohol you can buy at the local pharmacy). The alcohol helps to stabilize the liquid and the alcohol flashes off easily at room temperature and makes it easy and safe to use. 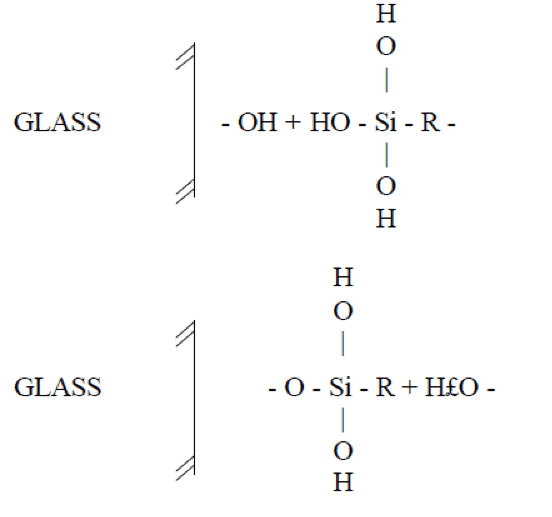 These silanol groups condense with the hydroxyl groups on the glass surface. After this condensation reaction, the coupling agent is bonded to the glass and is now reactive with the organic material (the tape). These properties allow these materials to withstand physical, chemical, weather, and thermal degradation. Silane pretreatment is essential when fabricating curtain wall and window wall systems that relay on acrylic structural glazing tapes. The added bond stability afforded by the use of the silane coupling agent reduces the risk of de-bonding in high humidity and moist conditions. The silane pretreatment is also used in attaching muntin bars for creating simulated divided lites on residential and commercial window systems. The glass surface should be clean and dry. If it is contaminated, it should be cleaned with a 50/50 mixture of isopropyl alcohol and water using a clean, lint-free cloth. Moisten the clean, absorbent, lint-free cloth with the silane solution and wipe over the area to be bonded with the tape in one direction. Alternately, the silane solution can be sprayed onto the perimeter to be bonded and wiped with a clean cloth around the perimeter. More is NOT better! Experience shows that a thin layer (monolayer) is much more effective and gives the best performance. To get that monolayer, the primed area should be re-wiped in one direction with a new lint-free cloth after the initial application. Under normal room temperature conditions, the tape should be applied within 2 minutes so that any residual moisture can evaporate. Sometimes we’re asked how a silane coupling agent works if it’s such a small concentration (less than1%) in the liquid. We remind them to think of baking muffins or biscuits at home where you use baking powder. You use a lot of flour and other ingredients but only a very small amount of baking powder because it is highly reactive. (in case you’re wondering, it works when the dry acid and base in the powder hits water and reacts to make carbon dioxide). You don’t need a lot to get a very big result. Tom Brown, Inc. offers premixed silence coupling agents under the 3M AP115 brand in convenient 4 oz. spray bottles. Contact us today if you’d like to learn more. Rick Alexander is the National Sales Manager for Tom Brown, Inc. His early experience was in R&D, product management, and sales management for both Main Tape and Adhesives Research, Inc. Rick brings his 35 years of pressure-sensitive tape experience and Tom Brown’s world class converting capabilities to help solve customer bonding, assembly, and sealing challenges.